All children should have books to call their own! Our goal is to get as many books as possible into the hands of New Jersey’s underserved children. We collect books through book drives, individual donations and donations from publishing houses. We supplement these with targeted book purchases; for example teen books, bilingual and young adult books. We believe that ALL children should have books to call their own and we are passionate about making this happen. From the very beginning we have aimed to ‘think outside the box’ and find new and creative ways to get books into the hands of all New Jersey children, anywhere and everywhere. Not just at schools, the logical place to do, but at community centers, at neighborhood events, through special youth partnerships, parent/child prison reading programs and special Bridge of Books Foundation sponsored events. In addition, we provide Spanish and bi-lingual books to agencies around New Jersey as requested. One of our oldest and most treasured partnerships has been with the New Jersey Youth Corps. The New Jersey Youth Corps is a full-time voluntary program with a strong focus on community service that provides education, work experience and life skills training to approximately 1,000 out-of-school youths between the ages of 16 and 25. Our relationship is a win-win for all of us, enabling Youth Corps members to identify and benefit children in their communities and allowing us to reach more children efficiently. One Youth Corps Supervisor reported distributing books to an after-school program in Camden that had NO books! The Bridge of Books Foundation has donated books to all eleven Youth Corps sites including Asbury Park, Camden, Trenton, Vineland, Jersey City and Edison. They have helped us distribute literally tens of thousands of books all over New Jersey. We participate in community events such as resource fairs distributing books directly to children who attend. Once the parents and children get over being astounded that BoB’s books are free, the children are delighted by an opportunity to select as many books as they want to take home and keep. At one event, we gave away over 1300 books in less than four hours! 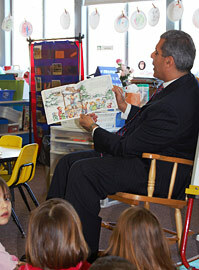 We also sponsor events to coincide with Read Across America Week. From massive book distributions to in-classroom reading, we love to celebrate Read Across America Week! The Bridge of Books Foundation over the years has participated in a prison-reading programs, donated to reading coaches and focused on the needs of bi-lingual readers. We are continually looking for new opportunities to reach all children who are so in need of books to call their own! To learn more about donating books, click here. To learn more about requesting books, click here.